Moving lawn tractor for loading on a trailer. Ramps are needed to load and unload a garden tractor on a truck or trailer. 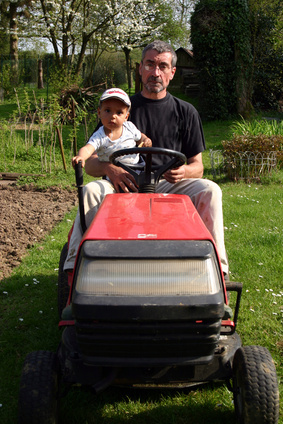 Plain wooden planks can tip and fall out of position because of the weight of the garden tractor. Wooden ramps for loading the tractor onto a truck bed or trailer are lightweight and inexpensive. They are easy to build with a kit and a few common tools. The addition of chains between the ramps helps to prevent the ramps from spreading apart during loading and unloading of the tractor. Align the ramp ends on the ends of the planks. Mark the location of the holes for the bolts with a pencil. Remove the ramp ends. Use a drill with a 3/8 inch drill bit to drill holes for the bolts at the marked locations. Place the ramp ends on the ends of the planks. Slide bolts through the holes in the planks and the ramp ends. Place washers on the bolts. Tighten them securely with a socket on both the head of the bolt and the nut. Measure the distance between the tires on the garden tractor. Place the ramps on the truck or trailer bed with the ramp ends on the lip of the truck or trailer. Align the ramps and space them so the space between the planks is the same measurement as the space between the tires on the garden tractor. Insert a screw in eye the hooks the same distance from the ends on the inside of both planks. Use bolt cutters to cut a length of chain to fit between the eye hooks on the ramps. Secure with the chain clips. After loading a garden tractor onto a truck bed or trailer, always place the transmission into a forward gear and secure the vehicle with wheel chocks. Add a piece of self-adhesive anti-slip matting to the underside of the ramp ends to keep the ramps from shifting during use.